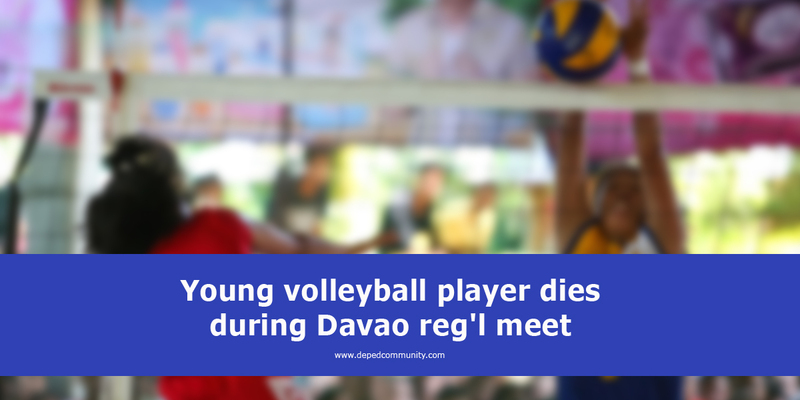 DAVAO CITY -- A promising 12-year-old volleyball "open spiker" from Davao Oriental succumbed to pneumonia here Wednesday evening, as the games for the Davao Regional Athletic Association (DAVRAA) meet are ongoing. Hadia Pantalion Eronico, a member of the Davao Oriental elementary volleyball team died hours after being rushed to the Southern Philippines Medical Center (SPMC). Jenelito Atillo, the spokesperson of the Department of Education in Region 11 (DepEd-11), said the young athlete had stayed in bed and refused to take food since Wednesday morning. She was rushed to the hospital after she coughed up blood, he added. Her coach, Joezel Mae Duro, said that prior to DAVRAA over the weekend Eronico had been complaining of headache and had been coughing. This prompted her to give the young girl rest and made her participate only in minimal training. Atillo said the volleyball player was declared dead at around 7:30 p.m. by Dr. Rani Valles, adding she was first diagnosed of multiple organ failure due to severe dengue but later declared to have died from pneumonia. He said DepEd is conducting its own fact-finding to determine the circumstances of Eronico's condition prior to her arrival in the city for the regional athletic meet. He added that Eronico was issued a medical certificate that she was fit to play, as one of the requirements before an athlete can be admitted by any delegation to the DAVRAA competitions. Duro said Eronico's death saddened the team, describing the player "a promising athlete and would have been in the first six if not for her condition." She said the coaching staff did their best to regularly check on her condition. Eronico was brought home by her parents to their hometown in Lupon, where she will be buried in Muslim rites.